Mule deer are fairly easy to identify by their large ears, here are some interesting mule deer facts about these neat animals. They have a brown coat in the summer and grayish coat in the winter in color, mule deer have a white rump patch and a small white tail with a black tip. The bucks or male deer grow antlers during the summer and shed them each spring typically in March, but can begin much sooner or later depending on the age of the buck. Mule Deer bucks antlers grow off from the main branch forming two branches, each branch can have 2 or more tines per side. Deer are not especially vocal, although young fawns bleat on occasion. Injured deer utter a startlingly loud “blatt” or bawl. During the mule deer rut in late fall, bucks will often grunt to show their sign of dominance or warning to other bucks and does. Seasonal movements involving migrations from higher elevations (summer ranges) to lower winter ranges are associated, in part, with decreasing temperatures, severe snowstorms, and snow depths that reduce mobility and food supply. Deep snows ultimately limit useable range to a fraction of the total. 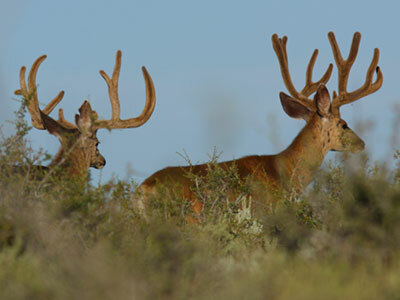 Mule Deer in the arid southwest may migrate in response to rainfall patterns. When startled, a Mule Deer will move in a series of stiff-legged jumps with all four feet hitting the ground together. This is called stating and is a very common gait pattern that offers two advantages: it allows the deer to out-distance predators in rough terrain, and to see above the thick brush. If necessary, they can turn or completely reverse direction in the course of a single bound. Mule Deer are active primarily in mornings, evenings and moonlit nights. This inactivity during the heat of the day is a behavioral adaptation to the desert environment that conserves water and keeps the body temperature within livable limits. Sweat glands and panting also provide evaporative cooling during hot periods. During the middle of the day, the Mule Deer bed or lay down in a cool, secluded place. The mature buck seems to prefer rocky ridges for bedding grounds, while the doe and fawn is more likely to bed down in the open. Mule deer can be found throughout desert regions as long as there is enough vegetation to hide in and to eat. They will move to higher elevations during the hottest parts of the summer and move to lower elevations during the winter months. They also are found in mountain forests, wooded hills and in chaparral. Mule deer are found throughout the entire western United States and located in some some middle to eastern states also. These deer currently are not threatened or endangered. However, mule deer have declined in almost all western states over the past several years and decades. Several factors limit increasing mule deer populations which include: habitat, hunters, encroachment, predators, highway mortality, disease, difficult winters, low fawn survival etc. Many states have purchased tracts of land in order to maintain the various habitats critical to the deer. Mule deer eat a variety of vegetation. They are known to eat mesquite leaves and beans, fairy duster, jojoba, cat claw, bitter brush, cliff rose, buck bush and other shrubs and grasses. Humans, coyote, mountain lion, eagles, bear, wolves, and bobcats. Mule deer usually live 9-11 years in the wild and can live to be much older when in captivity, up to 25 years. Mule Deer breed in late November and early December. A buck will find a suitable doe and they will often play chase games at breakneck speeds before mating. They will remain together for several days. When antlers start growing again in the spring, the group breaks up. The females go off by themselves and eventually give birth and nurse their young; the males wander in friendly twosomes or small bands throughout the summer months as antlers grow. From April through June, after about a 200-day gestation period, the doe delivers 1 to 4 young (normally 2). Fawns are born in late May or early June. A doe will usually produce a single fawn the first year she gives birth and then produce twins in following years. The fawn, colored reddish with white spots, weighs about 6 pounds at birth. It must nurse within the first hour and stand within the first 12 hours. During early weeks of life, the fawn sees its mother only at mealtimes for feeding. Spots begin to fade by the end of the first month.. They have white camouflage spots and are further protected by having little or no scent. Fawns usually stay with the doe for the first full year. Mule Deer range from 3.0-3.5 feet tall at the shoulder, 4.5-7.0 feet long and have a tail that is 5.0-8.0 inches long. they can weigh between 130-280 pounds. The female deer are smaller than the male. 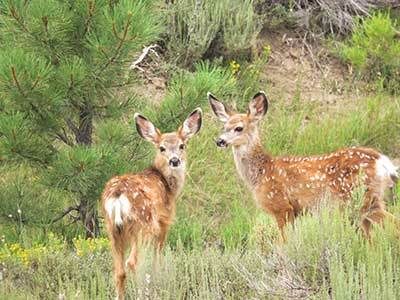 All federal, state, and provincial land and wildlife management agencies recognize the fundamental need to maintain Mule Deer ranges and keep them habitable. To counter the trend of agricultural development, rangeland conversion, mining, road and highway construction, and the development of housing tracts, many states and provinces have purchased critical areas, especially winter ranges, to maintain the various habitats of Mule Deer. But, due to political opposition to government acquisition of privately owned lands, plus a scarcity of funds for this purpose, only a small fraction of Mule Deer ranges has been acquired by the government. The annual cycle of antler growth is regulated by changes in the length of the day. Mule deer females often give birth to two fawns, three fawns is also possible. If it is their first time having a baby they often only have one fawn. Mule Deers antlers can growth as much as 1/2″ per day during spring and summer.